In the galaxy II Zw 40, dust (shown in yellow) is strongly associated with clusters of stars (shown in orange). 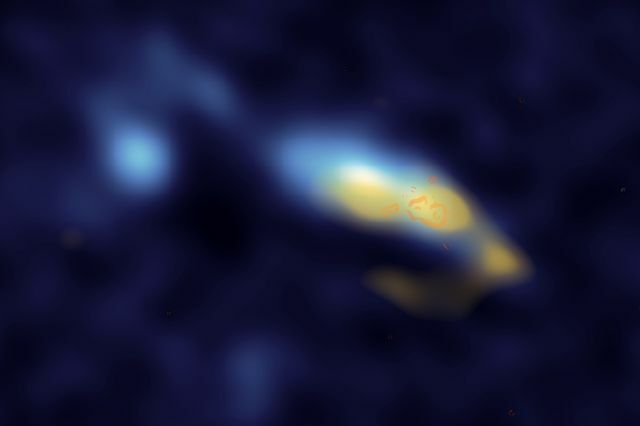 UCLA researchers have used new observations of this galaxy to confirm that these stars are creating enormous amounts of dust. Galaxies are often thought of as sparkling with stars, but they also contain gas and dust. Now, a team led by UCLA astronomers has used new data to show that stars are responsible for producing dust on galactic scales, a finding consistent with long-standing theory. Dust is important because it is a key component of rocky planets such as Earth. This research is published online today in the Astrophysical Journal Letters.